Since our beginning in 1967, we have had experience designing, manufacturing and distributing the highest quality ropes and elastic cords. Ropes and cords are produced in all common fibers. With fibers such as cotton, nylon and polypropylene and hi-tech fibers such as Kevlar, CSR, a rope manufacturer, is sure to get you the rope you need, in various constructions and finishes. Elastic cord, often referred to as bungee cord, is a cordage variety that is manufactured to include a multi-strand elastomeric core. Fitting a cord with an elastomeric core gives the cord the ability to stretch well beyond its unstressed length. When two ends of an elastic cord are pulled in opposite directions, the cord increases in length, and the tension of the cord increases as length increases. This tension makes elastic cords a good material for securing cargo during shipping, particularly in small-scale hauling applications. Elastic cords may be affixed with hooks, rings and other custom hardware, depending on their intended use. Elastic shock cords and assemblies are utilized in a variety of industrial and commercial applications. Most commonly, these cords are used as tie-downs for cargo and for suspension purposes. 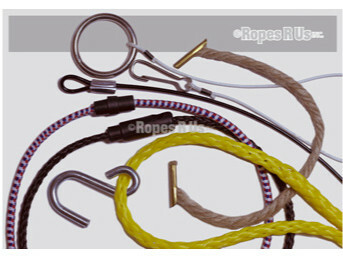 Bungee cords are manufactured to accommodate multiple uses, though repeated stressing and releasing of the core material can cause it to loose its elasticity after time. This process is accelerated if the cord is used in the presence of extreme temperatures or corrosive materials; it also depends on the composition of the elastomeric core material. Some elastomers exhibit better qualities of elasticity over time than others. Elastic shock cords can stretch up to 125% of their original length under full strain, though cord load ratings vary depending on the intended use of the cord. In addition to its rubber core, elastic shock cord is available with a variety of coverings that are designed to protect the core and accommodate stretching. Nylon, polypropylene and polyester are commonly used to cover and protect the inner elastomeric material. Polypropylene cord coverings resist aging, deterioration from UV exposure, acid exposure, mildew and moisture. Nylon and polyester coverings are also resistant to aging, mildew and acid and moisture exposure, though they are more easily damaged by prolonged UV exposure. Cotton is sometimes used in combination with other synthetic fibers, and the result can be an abrasion resistant covering. However, cotton ropes are among the least resilient rope varieties and are very rarely used in demanding applications. Overall, polypropylene cord coverings offer the best durability and longest lifespan, which makes it an attractive material for bungee cord manufacturers.